An interesting piece from MovieScope. what does this mean for my dvd collection? It was to be a revolution in the film industry. It would empower the consumer, allowing them to watch films on their own terms. It was to be a win for the little man against the corporate fat cats, the end of the big multiplexes dictating the terms of engagement. Independent filmmakers no longer had to rely—cap in hand—on the small windows of cinema exhibition; they could control how their film was watched. The industry was to be democratised. The year was 1975, and home video had arrived. 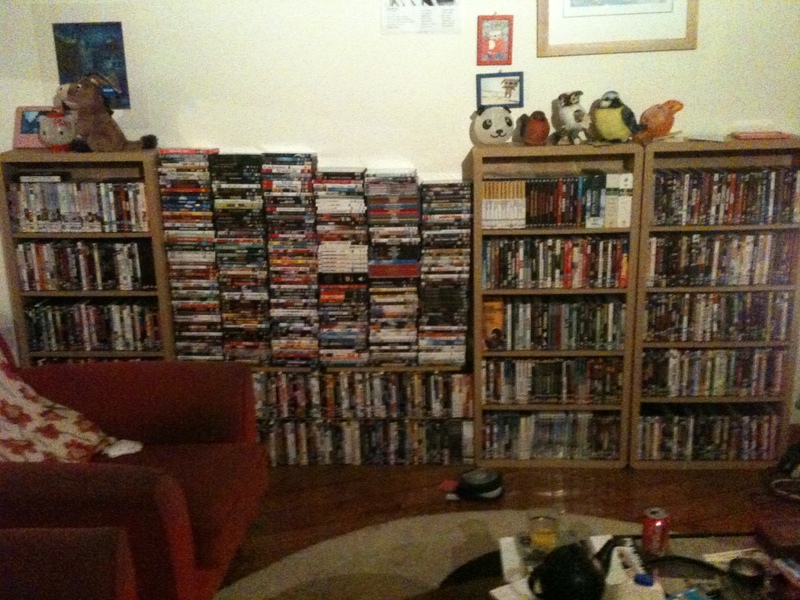 The VHS, and then in the late nineties the DVD, brought the cinema into the living room, to be watched at leisure. What we understood to be the box office broke up, and distribution became about feeding a series of ancillary markets; some films would be given a broad cinema release and a rush of publicity, then a traditional 16-week window would preface the launch of a VHS (or DVD) and then, eventually, a TV spot. But some distribution companies bucked the trend entirely by skipping a cinema release and directly targeting the stay-at-home audience. It became a tradition that carved itself a deep, sheltered niche in the industry; indeed, many distribution companies today see the majority of their returns coming from DVD sales. There are several reasons why a film is sent straight to DVD, as a source from BBC Worldwide explains: “Firstly a studio makes a film that is deemed unworthy of the cost of advertising and screen prints to put it in cinemas. It may be successful in one territory, like the US for example, but doesn’t translate to an international audience. Every once in a while, with films like Brick or Paranormal Activity, it pays off, but most of these tiny shoestring independents are lucky to get a DVD release at all. “A studio can also decide to make a sequel that exploits the cache of an existing brand,” our source continues. “American Pie is the obvious example. There are about nine American Pie films once you include all the spin-offs, and that’s not even including the original cast. There’s an acceptance the films won’t be good enough for a cinema release, but they are made in the hope that rental sales will be strong on the back of the original. That last point is key. The straight-to-DVD market holds a stigma because it’s the place where so many films slink away to die a lonesome death. Yet some films do slowly build an audience through word of mouth, and thrive. Away from the glare of the mainstream, the DVD market has become a refuge for the tawdry and the schlocky, the high-minded and polemical, the violent and depraved, the impostors and the cheats, the hostile, the abstract and the downright weird. And it doesn’t stop there. Further up the industry, films like Fight Club, The Hurt Locker, Lock Stock and Two Smoking Barrels, The Boondock Saints and even The Shawshank Redemption reinvented the wheel on their DVD releases after small and poorly handled cinema runs. The best practitioner of home entertainment over the years has without doubt been Disney. After the extraordinary success of the Aladdin sequel Return of Jafar in 1994, it’s now par for the course for Disney to release straight-to-DVD sequels of their flagship franchises. In 2010, the company sent four movies straight to DVD: Tinker Bell and the Great Fairy Rescue and The Search for Santa Paws made a combined $78m, while two Barbie spin-offs made a staggering $31m. But what does this mean in the current digital age, when anyone can make a film for a fraction of the traditional budget? Will this proud tradition of straight to video/DVD continue to exist in a marketplace that is almost at saturation point, and where distribution is having to contend with rampant piracy and consumers ever more willing to interact exclusively online? It’s now become de rigueurto the point of cliché to talk about VoD, online streaming and downloads, which have all become central to distribution, marketing, publicity and journalism. If last year’s Christmas shopping trends are anything to go by—iPads, digital consoles, Bluetooth TVs—2012 is the year that the Internet and the cinema will finally and inextricably fuse. The DVD sales and rental market is being soaked up by the big streaming companies—iTunes, a newly Internet-based LoveFilm and Netflix—with Vimeo and YouTube Movies coming up behind. There’s an almighty rush for both exhibitors and distribution companies—who might traditionally release 10 to 15 straight-to-DVD films a year—to team up with these media streaming companies. LoveFilm, recently bought out by Amazon, have recently announced a partnership with Sony Pictures Television, giving it exclusive rights to films in the second pay TV window. BBC Worldwide have partnered with Netflix, while iTunes are intently providing for most independent distributors. That has made for a brutal climate in which the chance of making a success out of a straight-to-DVD release is evaporating. As an executive at Miramax tells movieScope: “Twenty years ago, before the age of computers and digital cameras, directors were forced to shoot on film, and as a result there were much fewer DVD releases. These days, there are so many movies being released straight to DVD that distributors don’t have the time to sift through and find those diamonds in the rough. Even the films with a recognisable name and a great look and story face an uphill battle to create a buzz and generate any kind of significant sales, let alone the guys trying to make it out of nothing. The straight-to-DVD market can also be tough for distributors, as Oli Harbottle, head of distribution for Dogwoof, explains: “It’s very hard to generate much in the way of editorials when we release films just through DVD or another ancillary platform, and that’s probably due to the sheer quantity of films coming through in the industry these days. A lot of bigger companies throw 10 or 15 films against a wall and hope that one sticks, but we just don’t have the budget to do that and we wouldn’t want to do it anyway. David Bond is an independent British filmmaker and one half of production company Green Lions. For his first film, Erasing David, he used a limited, tightly controlled cinema release and worked every avenue to try and maximise press exposure and publicity. He then quickly made the film available on both DVD and online. “You like to think that everyone’s watching everything online, but they’re just not,” Bond says. “There’s something about the credibility of a DVD; you can go into shops or go on Amazon and it’s there, and people are talking about it in a way that they probably won’t if a film is just released online. In simple terms, the fact that you’ve been arsed to get out there and go through all the effort is a signal that you’re serious. With the purely online film which is standing alone and breaking all the rules, it still raises questions in people’s minds. You think maybe the filmmaker just couldn’t be bothered. It’s almost depressing, because you find yourself returning to the old models, but we’ve come less far than we think we have. The Erasing David model is reasonably typical. Although cinema runs rarely make a profit for the filmmakers, they pay their money back through creating that elusive thing called ‘buzz’ which sustains itself through the ancillary markets. In some ways, the rise of the Internet, and the saturation that has caused, has led to more emphasis on conventional publicity avenues. In 2011, Nick and Marc Francis released their film When China Met Africa straight to DVD and online. Specialising in ‘digital architecture’ through their independent production and distribution company Speakit, the Francis brothers have orientated their careers around new screening platforms, but yet still put out DVDs rather than throwing their lot in with the net. As Nick Francis explains: “From a consumer front, the DVD is still a critical way of people getting hold of the film, particularly when a cinema release is not going to access areas where there’s a waiting audience. If people want to organise a screening of one of our films, it’s still a critical platform. That’s particularly the case internationally. People from around the world are still buying our films every day through our website, so there’s still an appetite there for DVDs.